Listen, Judge (1952) starring Moe Howard, Larry Fine and Shemp Howard is a remake of the earlier Three Stooges short film with Curly Howard, An Ache in Every Stake (1941). The basic plot remains the same, but this time the short film begins with the Three Stooges in court on charges of vagrancy and chicken stealing. The judge, played by Stooge regular Vernon Dent, who drops the charges (a little prematurely) and the Stooges make good their escape. Working as electrical repairmen, they get a job repairing at doorbell at a mansion, and after their standard routine of pulling wires (and each other) through the walls, they alienate the domestic staff (including their French chef, played by Stooge regular Emil Sitka), who promptly quit. The lady of the house, wife of the judge from the beginning of the film, then compounds her error by hiring the Three Stooges to finish the important dinner. Shemp then stuffs the turkey in a literal manner, similar to Curlyâs performance in An Ache in Every Stake with one cute twistâwhen Shemp stuffs a can of tomatoes into the bird, Moe intercedes, pulls the can out, removes the label and returns the can inside the bird, commenting “Paper in stuffing! Ick!” The stooges again inflate the cake with oven gas, that instead of floating away, explodes when cut, covering everyone in cake, and prompting the Stooges to flee the party. Some nice points include a subtle jab at the political process by pointing out the Judgeâs exchanging favors with another politician, played by John Hamilton, best known for his role as Perry White in The Adventures of Superman. Once the cake blows up, so does the Judgeâs chance of election. A very good Three Stooges short, with an excellent performance by Shemp, I rate it 4 clowns. It is available on The Three Stooges Collection, Vol. 7: 1952-1954. Judge (Vernon Dent): We can’t support a charge of vagrancy. They have a visible means of support. Larry (Larry Fine): [to Moe] Does he mean our suspenders? Moe (Moe Howard): He thinks he’s a chicken. Judge (Vernon Dent): Why don’t you do something about it? Larry (Larry Fine): We need the eggs! Larry (Larry Fine): Hey, I found a wire! Moe (Moe Howard): Good work, Larry! Keep it up and I’ll give you some C-A-N-D-Y. Larry (Larry Fine): Aw, I don’t smoke. 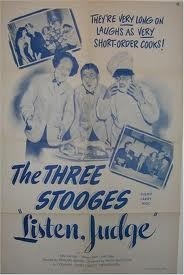 Listen, Judge is the first Three Stooges short released after Curly Howard‘s death. When Moe reprimands his two pals for pulling him through a wall, Larry claims to be a “victim of circumstance”, the only time in a short a Stooge other than Curly uttered the phrase.